Baia Sardinia is a well-known beach resort on the Gulf of Arzachena, near the famed Emerald Coast or Costa Smeraldo, on Sardinia's northeastern coast. It's a relatively small resort, home to just a few hundred residents. The village has grown as the popularity of the Emerald Coast has increased. In line with the regional growth, Baia Sardinia is composed mostly of hotels and villa complexes alongside shops, bars, and restaurants, all centered around a small square close to the beach and bay. Bays, coves, and beaches are home to crystal clear, blue waters and clean white sand. The beaches are well known for scuba diving and the bay's ideal position makes it perfect for water sports and activities such as sailing and windsurfing due to the good winds, waves, and currents suitable for water-based activities. The surrounding area of Costa Smeralda has a reputation for lively nightlife and is home to luxury hotels, clubs, and restaurants. Phi beach is particularly popular with visitors looking for a party destination. However, the surrounding areas of Baia Sardinia are also home to many quieter attractions and it is a suitable location for holidaymakers looking for a relaxing environment. Numerous beaches lie within close traveling distance to Baia Sardinia, making it an ideal destination for a beach holiday. Pevero Beach, 6km from Baia Sardinia, has a shallow sea-bed which makes it ideal for visiting with children, as well as fine white sands and clear blue waters. Another popular beach in the area is Phi beach, home to many well-regarded restaurants and beach-side bars, known for their grilled seafood and Mediterranean dishes, and famous clubs such as Billionaire. Phi beach is in front of an 18th-century naval fortress. 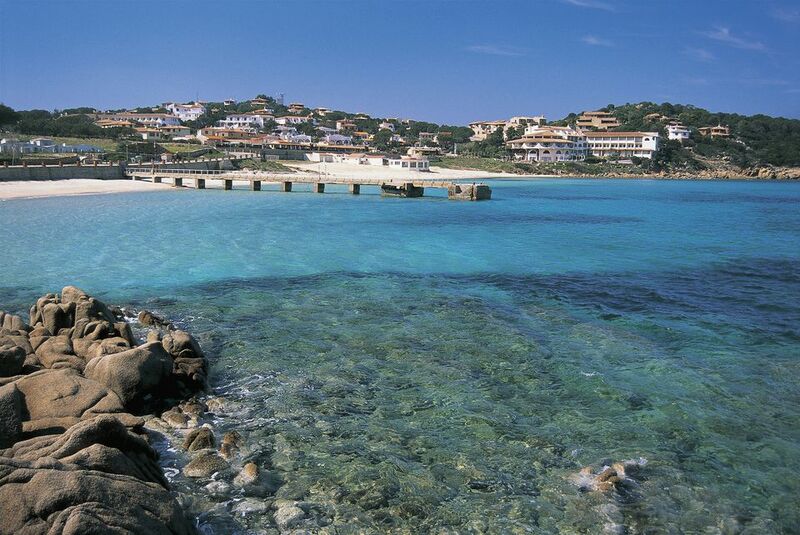 Costa Smeralda (Emerald Coast) is a well-known beach resort which is 55km long. This coastal area boasts a golf club as well as private jet and helicopter services. It's popular for sailing and the Sardinia Cup sailing regatta is held here in July. The area also boasts a number of archaeological sites such as Li Muri Tomba dei Giganti, or Giant's tomb, which is worth a visit. Porto Cervo. 4km away from Baia Sardinia, is a well-known destination for luxury holidays in Sardinia. The town's main square is lined with restaurants, shops, hotels, and clubs. Porto Cervo port is one of the best equipped in the Mediterranean and has 700 berths for vessels, making the Marina an ideal spot to spend an afternoon watching the celebrity-owned yachts and boats passing by. Porto Cervo has been home to famous sailing events such as the Sardinia Cup, the Swan Cup, the Veteran Boat Rally and the Maxi Yacht Rolex. The area has an opulent and luxurious reputation, attracting many celebrities to its prestigious clubs and luxury hotel resorts. For examples, see Porto Cervo luxury hotels. La Maddalena Archipelago National Park is a group of islands that make up a geomarine park on Sardinia's northern coast, in the protected stretch of sea between Corsica and Sardinia known as Bocche di Bonifacio. This area is home to a large array of wildlife and is protected to preserve the habitats and creatures. It has been deemed a Site of Community Importance and Special Protection Area. Aquadream Water Park, the first water park in Sardinia, has been constantly growing since its opening in 1987. The park spans 3 hectares and features water slides, a gaming area and a relaxation area with more than 1,000 chaise lounges and sun umbrellas, an ideal place for parents to pass the time while children enjoy the water slides. The park is very close to Baia Sardinia. The closest airport to Baia Sardinia is Costa Smeralda Airport in Olbia, about 35 kilometers away (see Italy Airports Map). The airport is served by several budget airlines with flights from Italian airports and a few European airports. Baia Sardinia can also be reached from Alghero Airport, 155km away, however, the drive takes about two and a half hours. Olbia is also a ferry port connecting with ports of Genoa, Livorno, and Civitavecchia on mainland Italy's west coast. If you are visiting Baia Sardinia by car from another part of the island, it is best reached by the SS131 road from Sardinia's east coast. When visiting Baia Sardinia and surrounding areas it is best to rent a car so you can visit the many bays and beaches close by and take day trips to local attractions such as the area's conservation zones and wildlife parks. You may find a reasonably priced rental car when you arrive but it is best to book in advance to ensure availability. Information for this guide was provided by Charming Sardinia, specializing in luxury hotels and vacations on Sardinia. What Is the Sedilo, Sardinia L'Ardia Festival?